NASA’s Juno Spacecraft provides astronomers with a view of Jupiter’s cloud tops as it passed by the planet at a distance of rough 52,200 kilometers. 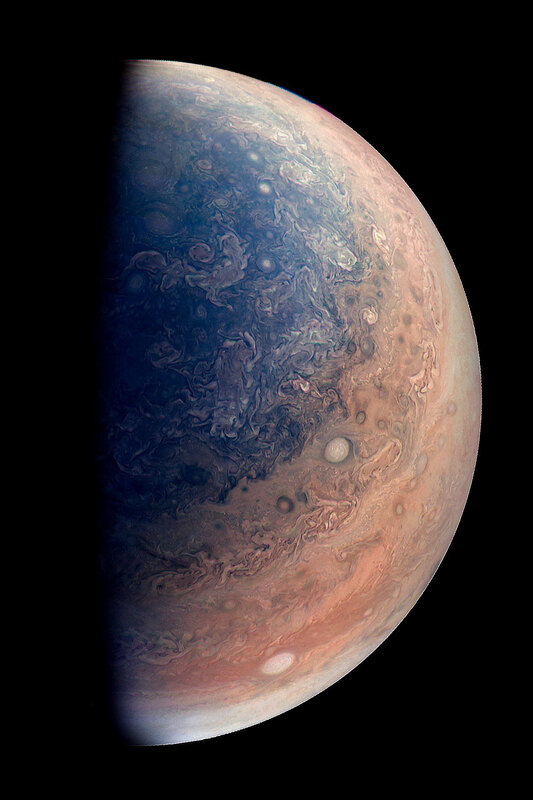 Using data from the JunoCam instrument on NASA’s Juno Spacecraft, citizen scientist Gabriel Fiset created this enhanced color view of Jupiter’s south pole. Oval storms dot the cloudscape. Approaching the pole, the organized turbulence of Jupiter’s belts and zones transitions into clusters of unorganized filamentary structures, streams of air that resemble giant tangled strings. The image was taken on December 11, 2016 at 9:44 a.m. PST (12:44 p.m. EST), from an altitude of about 32,400 miles (52,200 kilometers) above the planet’s beautiful cloud tops. Be the first to comment on "NASA’s Juno Spacecraft Views Jupiter’s South Pole"